What is 8BitMMO? Well, that's simple, it's a sandbox game, created by players for players. It does not take itself seriously and that is supposed to play in it's favor; it does not. It just ends up looking juvenile. The concept just blows the mind, an mmo world that you have complete control over, you can build your cities how you want, and other players can explore them. Players can't destroy your stuff. There are PvE and PvP areas. It has so much potential! What I found when I entered the world was a lazy feeling. There are many, many more 8Bit titles with better graphics; the game had pratically no sound for graphics to speak of. The sum of it's parts were the parts themselves. Final Fantasy style message windows greeted me with LOL and ROFL. I was sent on a quest to kill Lawyer Cats and Hipsters. Sorry, no thanks. I like internet memes and I like MMOs, but never should the two cross over; what you are left with is a shitpile. When done right, text based and retro pixel mmos are extremely fun. I'm going to go ahead and cite Lensmoor.org for the text based verity, and Realm of the Mad God for the 8bit verity. Admittedly, Realm of the Mad God isn't really an RPG at all, although it has RPG elements it is a top down shooter. That said, the the graphics, music, and presentation are all engaging, the game-play is exciting when the looming threat of death has your character DELETED. So, if it's supposed to be more like 2D version of minecraft, well, we have that, it's called Terraria and that too is done extremely well. My largest complaint is that the world and your being in it just felt pointless; that is sometimes the result of a sandbox situation but this is over the top. A feeling like "You are here for a reason BUT you can build all you want as well." A little more work put into the 8bit sprites, shading and what not. 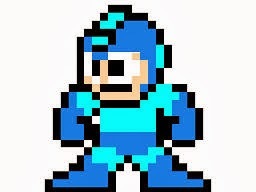 (see Megaman for an example).